I've always kept tabs on my public profile out on the web. Sometimes it's surprising what you can find. You might have your own Google Scholar page because of a college paper you wrote when you were 18 or find out you were scheduled to speak at a conference in another country well before the organizers reached out to you. 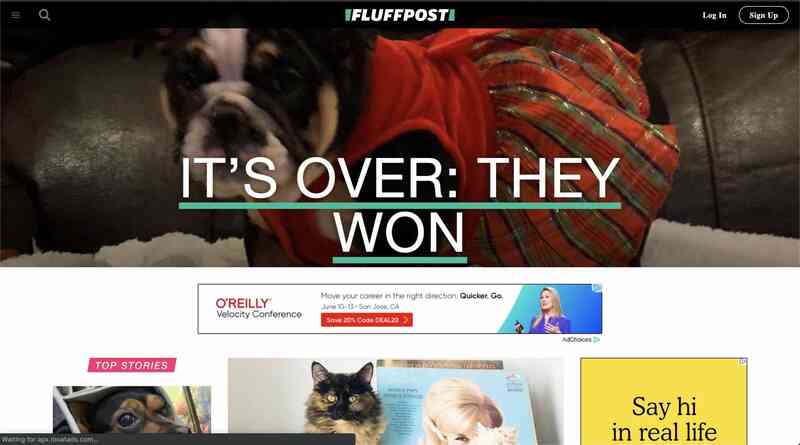 Today I found out an old project of mine is being used on HuffPost—or should I say, FluffPost? Go check it out! 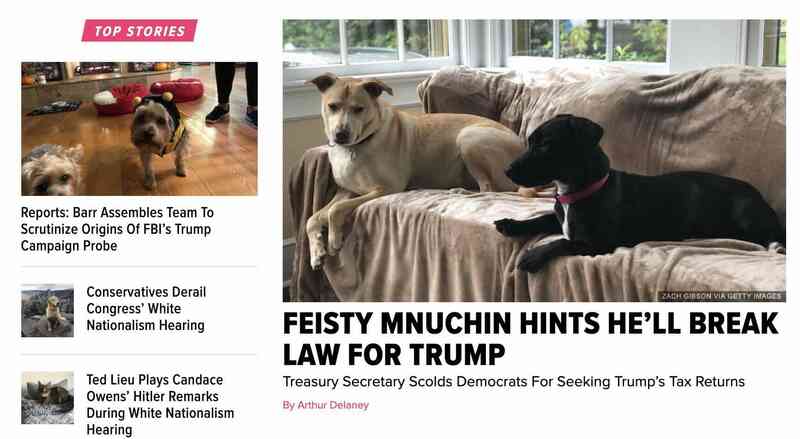 If you go to the HuffPost's homepage and enter the Konami Code all of the images turn into adorable photos of people's pets. Mnuchin definitely looks feisty. And that team Barr is assembling looks like serious business. I'm sure they'll get to the bottom of things. I accidentally stumbled across this not via a Google search but by doing a search for my name on GitHub in other people's code repositories. This might seem a little odd, but if you've created or contributed to a lot of open-source projects it's an interesting view into how people might actually be using what you've made. It's also a good way to see if a private repository you handed off to another development agency accidentally found it's way into the public... but that's a different story! In looking for my name I came across references to a project of mine in what looked like code scraped from the homepage of Huff Post. The code contains comments with information about licensing, the version and a byline with my name, which is what helped me find this. I decided to go the Huff Post and try the code out. When I entered the Konami Code and saw the pets I laughed, and when I went to view the source code for the page I was tickled to see my name and code sitting there. Konami-JS is an open-source easter-egg project I made back in 2009. It lets you add an Easter Egg to any website when a visitor enters the Konami Code. The differentiator, at the time, was my project worked on mobile devices. Most of what I find are people putting Konami Code easter eggs on their GitHub pages, blogs and other personal projects. Occasionally it pops up in bigger places like Marvel.com or Newsweek. I recently discovered it was even being used on Tesla's online design tool back in 2012—I found remnants of it on archive.org here. I guess now I can add Huff Post to that list! As the barrier to entry into web development seems to grow a little steeper each year, I'm happy to have contributed a project that's being used by novices and high-traffic websites alike. I'm also happy that it's a joyful, frivolous contribution that's been mostly used to make the web a fun and sillier place. Lastly, I do have open issues and discussions on GitHub surrounding what Konami-JS 2.0 could/should look like, a decade later. Your contributions are welcome.